Almost every funeral home at some point has had church fans made as a marketing promotion. And though it seems like a good idea, marketing success or results are hard to measure. When "church fans" is searched for on Google, you will find most fans cost about 50 cents each. And for each church, you probably should order at least 500 fans, making the cost per church at around $250. Why not consider giving a church a mobile-app instead? Mobits is focused on the funeral industry, but at $250, we could provide a mobile-app for a church that would have a weekly sermon page, word of the week page, church calendar page, a pastor's page and of course, an obituary page. The mobile-app would also include an advertisement for the funeral on every page and a click-to-call funeral home button as well. Mobile-apps are "stickier" than church fans because once someone has the church app on their phone, they are unlikely to take it off. How many times have you been at church and saw one of your fans in the garbage can and was tempted to take it out?! 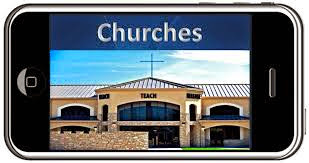 Mobile-apps stay with the person, church fans often stay at the church. So the usefulness of church fans is extremely limited if they stay at the church. If you are considering buying church fans, those dollars may be better spent on giving a church a mobile-app.